Vivus Architecture + Design » Archive » We have framing and our first (minor) glitch! We have framing and our first (minor) glitch! Today the first new walls were framed, a milestone! Our contractors also worked with the existing headers in the old screen porch. The goal was to have the new windows match the existing windows’ head heights (top of window match top of window). 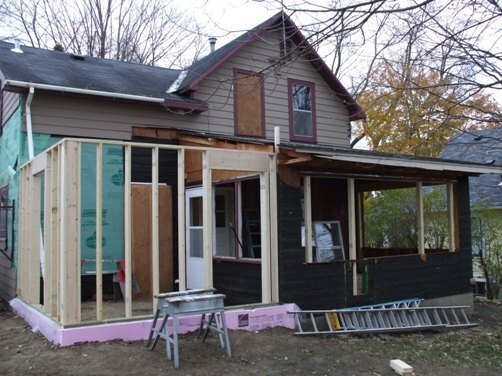 Demolition revealed that the existing headers were too low to make that work, since the existing porch floor is a couple of inches lower than the rest of the house. Since we were trying to land-fill as little as possible, we tried to save the porch walls. You have likely heard that it is cheaper to tear down and rebuild new than to futz around with saving existing construction; well, in this case it is probably true. Our desire to be green saved a few walls, but no money here and the windows will not line up by a couple of inches. So it goes in remodeling. We could still pull down the existing walls and rebuild new, but that just doesn’t make sense to us in terms of budget, sustainability, time frame, nor aesthetics, honestly. Take a look at the old homes around town. Each seems to have some idiosyncrasies of its own and ours will be no different. The weather looks dry for the next week, so major demolition is scheduled. Stay tuned! The plan is to remove the 1/2 story walls, roof, and ceiling from the second floor up. Trusses arrive on Tuesday and a crane is scheduled for Wednesday to set them in place; things will start happening quickly now, if the rains stay away. Posted in All Entries, Portfolio + Projects Comments Off on We have framing and our first (minor) glitch!